Pancakes might just be the best breakfast food ever. They are quick, easy and the toppings are almost endless. Plus, they are really easy to make healthy too. 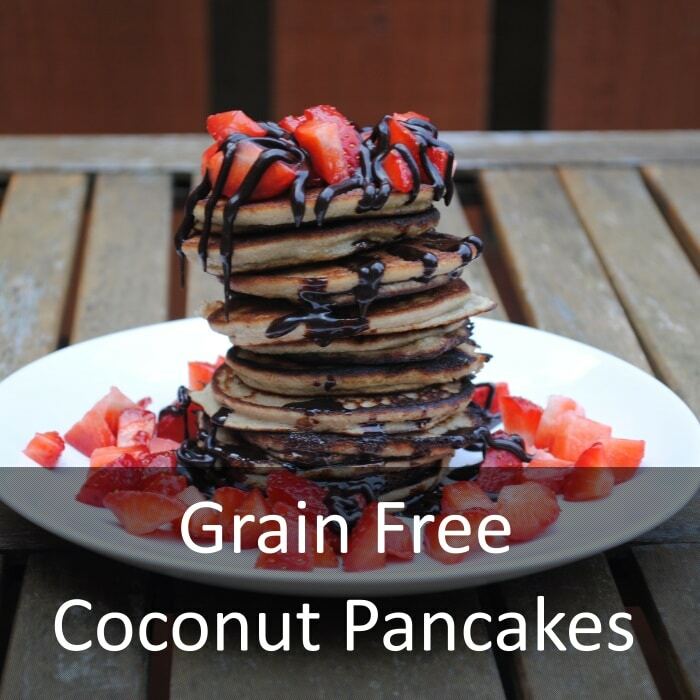 These delicious grain free coconut pancakes are the perfect example of that. They are just 200 calories per portion. I have been talking about making these pancakes for a long time. So, on a dull weekend morning I took the plunge and decided to brighten up a grey day with some delicious coconut pancakes. The added bonus is that they are grain free – perfect for those of you that are gluten free or Paleo. You asked for more gluten free/Paleo recipes and that is exactly what I am going to give you! I have been experimenting with coconut flour a lot recently and I have to say that I love it! It is lighter than almond flour, which makes it a good ingredient for things like pancakes and muffins. Take a look at my Healthy Carrot Cake recipe that I use coconut flour in. Just how coconutty (is that a word?) are these pancakes? Well, they have coconut flour and coconut milk in them and they are cooked in coconut oil. Surprisingly, they are not overly coconutty (I have written it twice now, so it is definitely a word), but just the right amount. Coconutty. Coconutty. Coconutty. There! It is out of my system now. Once bubbles start forming on the pancakes, check that they are fairly sturdy and then flip them. They should take around 3 minutes each time. Cook in batches until they are all cooked. Serving suggestion - strawberries and chocolate sauce (I used ChocShot as it is awesome and healthy). What’s your favourite pancake topping? Leave a comment below! These pancakes look amazing, Dannii! 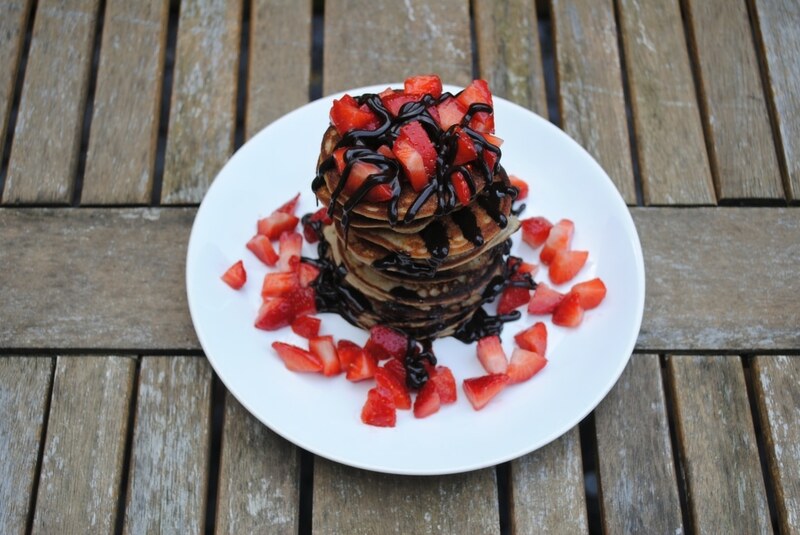 Love the chocolate sauce drizzled over- so delish! 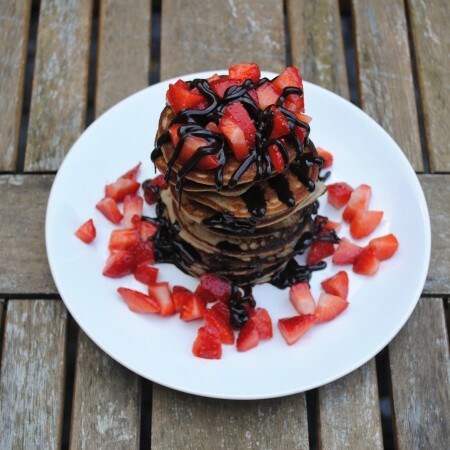 Chocolate sauce is the way to go with pancake toppings!